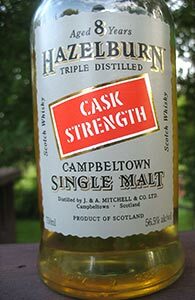 Hazelburn is the unpeated, triple distilled whisky made at the Springbank distillery in Campbeltown. There’s not that much Hazelburn out there in general release. There have been a few releases of an 8yo and a 12 yo, and more recently, the Hazelburn CV (not sure if this is ongoing or if it has been discontinued a la the Longrow CV). Other than that there have been some one-offs; for example, a recent 8yo double matured in bourbon and sauternes casks. 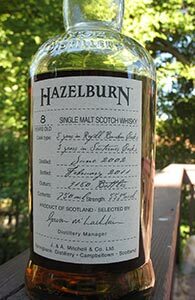 I’ve never been too moved to give Hazelburn a try because the prices seemed too high (especially for the 8 yo) and my preferences generally tend to run towards more robust profiles. However, when Binny’s included the Hazelburn 8 yo in a recent closeout sale I decided to give it a shot. Their site seemed to indicate that I’d be getting the second release of the 8 yo at 46% but what showed up was a cask strength bottling at 56.5%. There’s not too much information out there on this: Whiskybase indicates that it was a single bourbon cask release of 228 bottles for the US, but it doesn’t actually say this on the bottle.